New Hampshire's FIRST Blackout Feis! This is a blackout feis! No wigs, no dresses, no buckles or bling. Hair should be neatly pulled off the face with black dance attire and black tights. Please see our feis syllabus for further information. Parking is available all around the school. If there are no spaces please carefully park along the side of the road, being mindful of snow banks. At the Cooperative Middle School venue, camping areas will be in shorter supply, especially in the Band Room. “Camping” (where you set your stuff) is allowed along the huge hallway loop that encircles the library. The Gym locker rooms will be open as well. Please refrain from camping in the lobby or cafeteria/awards areas. Lastly, if you or someone you know did not sign up for the feis, there will be NO day-of registrations taken at the door and as with any feis, there are no refunds. WE LOOK FORWARD TO A FUN-FILLED DAY OF IRISH DANCE! WIG FREE & FEIS! A block of rooms have been reserved at the Hampton Inn in Exeter NH for a special rate of $84 per night. To book, call the Hotel directly at (603) 658-5555 and reference "Murray Academy Winter Feis"
select arrival and departure dates, click "add special rates" , using MAW in the GROUP code box. 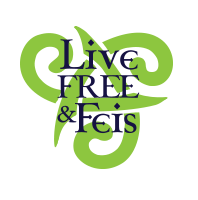 Special feis rate will be available until 12/20/2018 or until the block fills, whichever comes first. Hampton Inn has a 4 day cancellation policy. Bookmark this page for the most up to date Murray Academy Winter Feis information. If you can't find the answers you need here, feel free to email us. The Murray Academy Winter Feis is sanctioned by the NAFC North American Feis Commission.